Corporate Social Responsibility | Mercan Canada Employment Philippines. Inc. 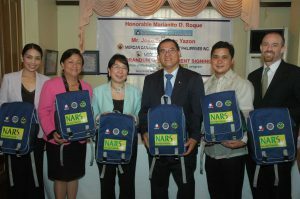 In 2009, Mercan Canada Employment Philippines Inc., in partnership with Mercan Recruit LTD, turned over 10,000 units of medicine kits to the Department of Labor and Employment (DOLE) of the Philippines. DOLE Secretary Marianito D. Roque received the medicine kits with much gratitude. The medicine kits which cost a total of US$200,000.00, contain a variety of medical instruments which equipped nurses under the Nurses Assigned in Rural Services (NARS) program with tools that helped them in their service training. Under the program, unemployed nurses were mobilized in their hometowns as warriors for wellness to implement primary healthcare and school nutrition programs, maternal health programs and initiate first line diagnosis. They also provided information about community water sanitation practices, conduct health surveillance and immunize children and mothers. Nurses were deployed at an average of 5 per town in the 1,000 poorest municipalities for a six-month tour of duty. These nurses underwent training and development for competency enhancement in accordance with the training program designed by the DOH (Department of Health) in collaboration with the PRC-BON (Philippine Regulation Commission-Board of Nursing). The training program covered both the clinical and public health functions. Completion of the training program under the NARS program was considered as a substitute for the work experience requirement of hospitals and other health facilities, both local and overseas. The Certificate of Completion was issued jointly by the DOLE, DOH and PRC-BON. The Philippine Government through the leadership of then, President Gloria Macapagal Arroyo recognized this contribution and a Presidential Citation was awarded to Mercan last June 28, 2009.